Take a moment to immerse in total relaxation. That’s what happens when a Edison™ spa from Sundance becomes a part of your life. The Edison is a spacious tub, comfortably fitting up to six adults. To enhance your spa experience, the Edison comes standard with a Custom Luxury (CL) package. This spa has the beauty and the functionality, you’ll want to have. CL Designer Jets in stainless steel put the polish on your spa and accentuate the multicolor glow from the LED Lighting. 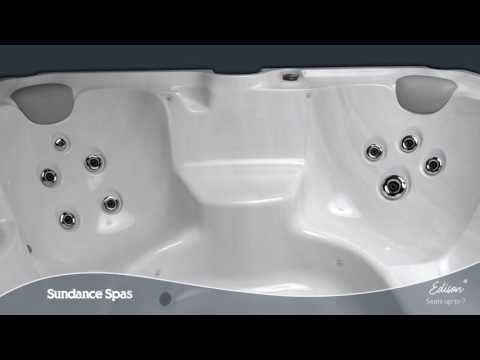 All of the Custom Luxury features are standard and factory-installed, so you can enjoy them from the moment you get into your new spa. The BLUEWAVE™ spa stereo system is available as well. These finishing touches add even more to your backyard experience.